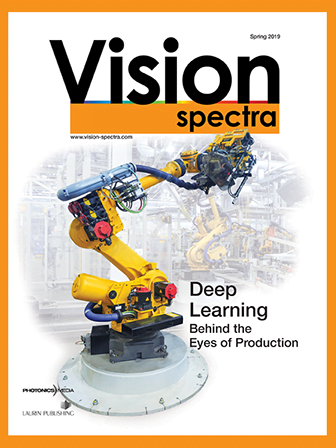 Machine vision has been widely used for quality control of industrial processes, but glossy-surface inspection has only been possible manually. Now, a new quality control system can analyze all kinds of glossy, high-curvature or angular objects. VTT Technical Research Center of Finland, working with Helmee Imaging, has enabled the quality control of complex, glossy objects such as bathroom faucets, tableware, cutlery and artificial joints through a new machine vision system. Machine vision offers glossy quality controlThis machine vision prototype from Helmee Imaging allows for the quality control of glossy objects. Photo courtesy of Petri Lehtonen. An object’s surface quality and 3-D shape are measured simultaneously through Helmee’s covered stereo phase measuring deflectometry method. Based on a combination of structured lighting and stereo imaging, the system measures how the surface distorts predetermined illumination patterns in place of traditional surface imaging. Pattern projectors generate 80 million triangles onto the glossy object by bending and diffusing light rays through an optical dome while two cameras record the light’s behavior. Once the camera and projector dome points are known, the object’s surface point is found and the object’s properties can be calculated through an algorithm. The system’s X-Y resolution is about 0.1 mm, and the Z resolution is ~1 µm, allowing the smallest surface defects to be seen. A precisely defined series of steps that describes how a computer performs a task.